I just closed down my account with TDAmeritrade. I transferred everything to Izone.com. Funnily enough, Izone is owned by TDAmeritrade and offers EVERYTHING that my regular TDAmeritrade account offered. Infact, the user-interface is identical. Its so identical, that the new username and password I created at izone.com even works at tdameritrade.com!!!! So whats the difference? All the commissions are half-priced as compared to TDA. But whats the catch? There’s no phone support and you need to have a couple of years online trading experience in order to open an account. Actually, I’m not sure about the ‘no phone support’ policy – I suspect that if you call up the customer support number for TDA and give them your izone username, it just might work. In any case, I usually asked my questions via email at TDA, so there’s no difference for me. And izone also has a live ‘customer support chat’ feature during normal business hours which has less wait time than the phone lines. I did an internal transfer since my old account was at TDA. It took place at 11:45 pm so my regular trading wasn’t affected at all! Now thats some decent service! Let me know if you want to open an account and I’ll send you a referral email. I think we both get 10 free trades. Friday’s stock market had a distinct sense of deja vu about it. Even though it was down overal, I was reminded of the crazy dotcom days in late 1999 when any tech stock could rally 25-50% in a single day! One of my friend’s subscribes to a stock newsletter. Periodically he gets an email alert informing him when a stock is about to make a significant jump. He often sends them to me and I usually look at them and then ignore them. Yesterday he sent me an email about a China Clean Energy Inc (CCGY.OB). By the time I got the email, it had already jumped 30% that day, but I really liked the chart. It had retreated about 15% from the highs of the day and looked like it was ready to make a move back up to the $2 range. This is what the chart that I follow looks like. The image is bit hard to understand since they’re aren’t any notations on it. The first chart is the intra-day stock price of CCGY.OB for September 28th 2007 using Candlesticks. It also has the bollinger bands and exponential moving average lines. The 2nd chart with red and blue vertical lines denotes the volumne. The 3rd chart is the Relative Strength Index (or RSI) with oversold and overbought indicators. The 4th chart is the Moving Average Convergence/Divergence indicator orMACD. The last chart is the Slow Stochastic. From these charts I felt that there was sufficient momentum in the stock to carry it higher, despite it having already jumped 30%. I was able to buy in at $1.73 around 12 pm EST (which was 9 am for me) and sure enough it continued higher throughout the day. It closed the day at the highest price of $2.23, for a stunning 28.9% one day gain! Although the stock was up ~60% for the entire day, I was very happy with my 28%. Made me feel like I was reliving the good old dotcom (or dotbomb) days. Here’s a much better daily chart. Very rarely do I buy stocks based on tips and without looking at any underlying fundamentals. Usually, the newsletters that I subscribe to, will recommend a stock based on good, solid fundamentals and I will use the charts to determine the market sentiment for that stock and a good entry point. 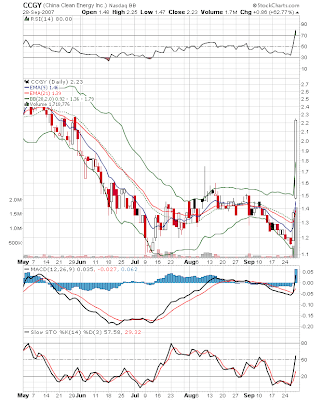 Recently, Freight Car America (RAIL) was recommended, but the chart looked terrible and I didn’t buy it. Sure enough it dropped from it’s recommended price of $48 and is now trading at $38. Here what the chart looks like. I’ll wait until the technicals improve before I jump in on that one. Sometimes this strategy will backfire because some breaking news will come out that will send the stock shooting the opposite direction than expected, but it doesn’t happen often enough. And unexpected news can make value investors look like fools too! Most traders use some form of technical analysis. Many investors believe that technical analysis is rubbish and doesn’t work, but they probably feel that way because they don’t understand it. Its basically a representation of the current market sentiment based on price and volume action. Most traders use some from of it and it can get fairly complex. Studies have shown that currency traders use it a lot (or atleast the successful ones!). I’ve attended several currency traders meetup sessions and they all use some sort of technical analysis to trade in and out of their positions. That and proper money management is the key to succesful trading. I strongly recommend at least learning the basics and deciding for yourself whether to use it or not. Getting Started In Technical Analysis is a really good book that’s fairly easy to read. If you’re interested in learning about trading, I strongly, strongly recommend Trading for a Living: Psychology, Trading Tactics, Money Management . By far one of the best introductory books on the subjects. You’ll get more out of it than a $5,000 seminar! If you like to day (or swing) trade, you’ll also enjoy An American Hedge Fund: How I Made $2 Million as a Stock Operator & Created a Hedge Fund . A fascinating story about Timothy Sykes, a college student who made a million dollars day trading and started his own hedge fund. In an earlier post on investing on news, I had sold puts on JRCC. 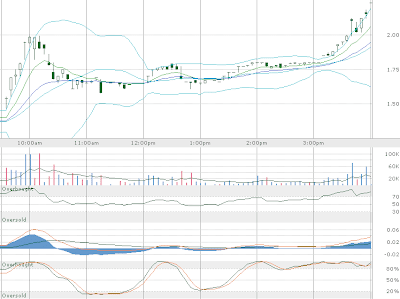 Well JRCC was up sharply in the past few trading sessions. I closed out my position by buying back my naked puts and netted a 38% profit (sold the puts for 1.95 and bought them back for 1.20). There’s a chance the stock might go higher. But, I bought puts because it was a speculative trade and the idea was to make a quick (or somewhat short-term) buck. It went up, I made money so its time to get out. Thats the good thing about options. They prevent you from getting married to your positions. That can be a dangerous thing if the market turns against you (speaking of which, I’m really glad I closed out my Countrywide puts after they started going against me. When I closed my puts, the stock was at $37 – now its almost $42). Now if I could only figure out a way to make 38% returns EVERY 2 weeks!!!!! I read an email today that mentioned China (who is already the planet’s largest coal consumer) claims it will need an extra 80 million tons by next January. India is also estimated to need an extra 120 million tons, and most other Asian countries are expected to increase demand by 7%. Since I like to take advantage of investment opportunities whenever I come across them, I placed an order to sell PUT option contracts on James River Coal Company (JRCC). Its essentially a long position on the companies stock, which has nicely trended up 50% in the past several months. If the order is executed tomorrow (the order was placed after hours) I get a net credit of $195/contract. By september, if the stock trades above $8.05, I’ll have made a profit. My maximum profit is $195/contract and it occurs at stock prices over $10.00. If the stock drops below $8.05 I will either have to buy it or sell my option before expiration date at a loss. But I’m bullish on the stock so the loss would be smaller than actually buying the stock outright. If the stock stays at the same $9.50 price, I’ll still make $145/contract at expiry. Both my upside and my downside are limited, but I think there’s a great chance I’ll make more money selling the puts with a lower risk than by buying the stock outright. Plus for each contract instead of putting up nearly $1000, I’m collecting $195 instead. It does use up my margin limits, but it does mean I don’t need to pay interest on the amount, since I’m not borrowing any money. Of course you manage the risk here by not betting the farm. If the stock moves against me and my option moves against me 50% (ie, I’m down $100/contract) I’ll close out my position. Since this total draw-down is only 0.33% of my portforlio, it doesn’t give me ulcers. And while the total profit is only 0.66% of my total portfolio and isn’t exactly an earth-shattering return, its a 2-1 risk-reward scenario that I’m comfortable with. If the stock goes BK overnight and I lose the max $805 per contract, it still only 2.66% of my portfolio, which is a bearable loss. Remember, risk management will determine whether you succeed or fail in the long term. Every year Dennis Gartman publishes his “Rules of Trading.” Here they are. 1. Never, Ever, Ever, Under Any Circumstance, Add to a Losing Position… not ever, not never! Adding to losing positions is trading’s carcinogen; it is trading’s driving while intoxicated. It will lead to ruin. Count on it! 3. Mental Capital Trumps Real Capital: Capital comes in two types, mental and real, and the former is far more valuable than the latter. Holding losing positions costs measurable real capital, but it costs immeasurable mental capital. 6. “Markets Can Remain Illogical Far Longer Than You or I Can Remain Solvent.” These are Keynes’ words, and illogic does often reign, despite what the academics would have us believe. 8. Think Like a Fundamentalist; Trade Like a Simple Technician: The fundamentals may drive a market and we need to understand them, but if the chart is not bullish, why be bullish? Be bullish when the technicals and fundamentals, as you understand them, run in tandem. 9. Trading Runs in Cycles, Some Good, Most Bad: Trade large and aggressively when trading well; trade small and ever smaller when trading poorly. In “good times,” even errors turn to profits; in “bad times,” the most well-researched trade will go awry. This is the nature of trading; accept it and move on. 10. Keep Your Technical Systems Simple: Complicated systems breed confusion; simplicity breeds elegance. The great traders we’ve known have the simplest methods of trading. There is a correlation here! 13. There Is Never Just One Cockroach: The lesson of bad news on most stocks is that more shall follow… usually hard upon and always with detrimental effect upon price, until such time as panic prevails and the weakest hands finally exit their positions. 14. Be Patient with Winning Trades; Be Enormously Impatient with Losing Trades: The older we get, the more small losses we take each year… and our profits grow accordingly. 15. Do More of That Which Is Working and Less of That Which Is Not: This works in life as well as trading. Do the things that have been proven of merit. Add to winning trades; cut back or eliminate losing ones. If there is a “secret” to trading (and of life), this is it. 16. All Rules Are Meant To Be Broken…. but only very, very infrequently. Genius comes in knowing how truly infrequently one can do so and still prosper. “Bank of America Corp., seeking to attract new clients, offered free online stock trades to customers with accounts of at least $25,000, sending shares of discount brokers lower.